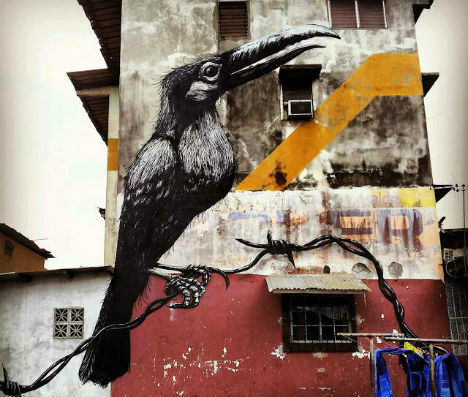 The streets of Panama City are now crawling with exotic birds, iguanas, lemurs and other creatures measuring up to three stories in height after a visit from famed Belgian street artist ROA. 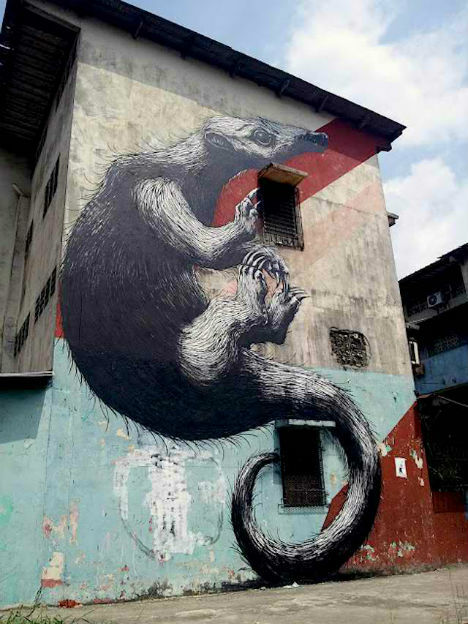 Following his exhibition in Brussels last February, ROA made his way to the Latin American nation to work on new mass-scale pieces in his signature monochromatic style, set against broad stripes of color on stained, peeling urban surfaces. 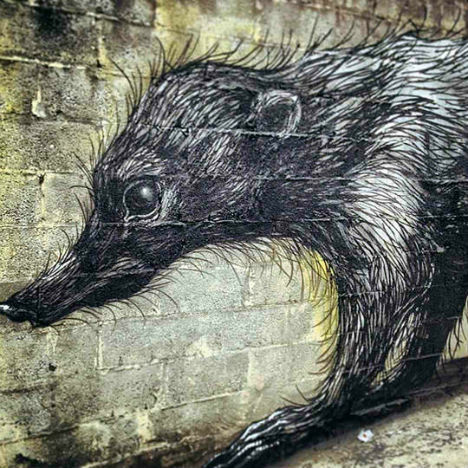 Animal are ROA's favorite subject, and the artist often chooses species that are native to the areas in which he's working. 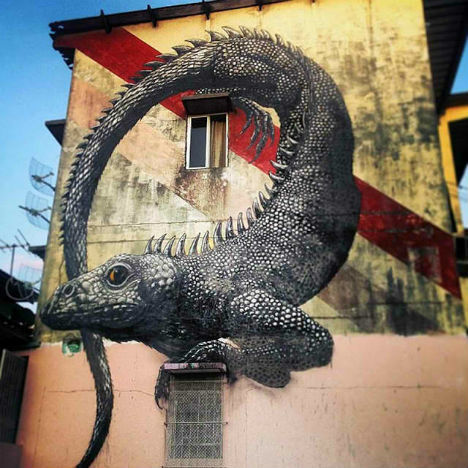 This faunal imagery contrasts with the stark concrete and asphalt spaces of the city, bringing in a connection to nature as well as some spectacular art that people from all walks of life can enjoy as they go about their daily routines. "Since I was a kid I drew animals, so I wanted to paint like I draw, but more plastic and looser. I gave it a try on the wall… I got inspired to go up to paint in left-behind factories and hidden places and experiment with lines and scales. 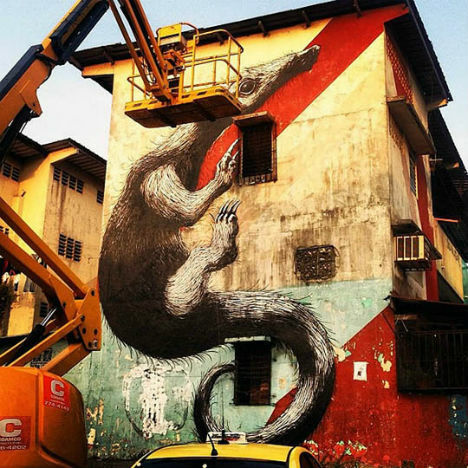 I was still enjoying it because every wall is different; the environment, the social life around it, the external conditions, the depiction, the challenge is always there." 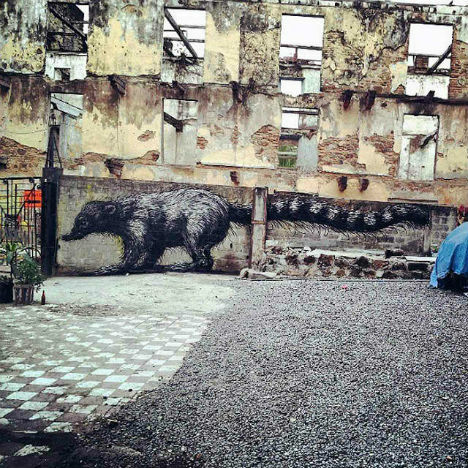 Check out ROA's previous work in Mexico City as well as some panoramic pieces and lenticular art, which changes depending on the angle from which you view it.